He writes: "Congratulations with your beautiful and very informative web page. 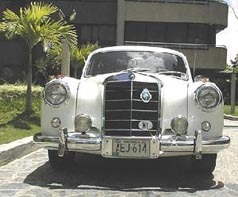 This is a real tribute to the Ponton series of Mercedes-Benz. I decided to send you this letter, because I noticed you don't have a Ponton as mine in your list. There is one other model. That's the 220a. 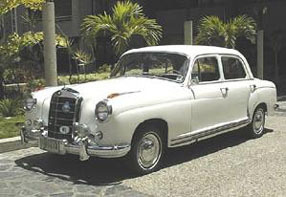 This model was never exported to the US, but this was the very first model of the Ponton series. 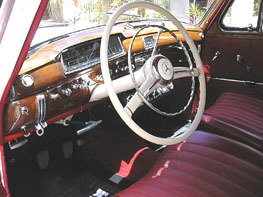 My car was built in 1955, and sent from Germany to Venezuela on order. A doctor had it for 40 years and kept it in good condition. I bought it in 1994 and drove it for a while." 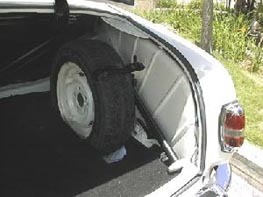 "My car was repainted in metallic blue and the body had quite some rust and bad spots. So I decided to restore this car from the ground up in it's original color. I took this car apart in every way. Only the skeleton was left. I painted these parts one by one and built this car again. 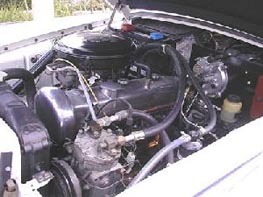 The engine, gear box, drive train, front and rear suspension were all overhauled. All the wood work was professionally done at a furniture factory. 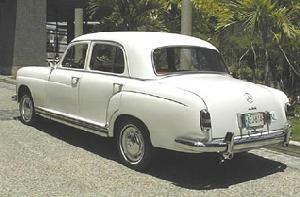 Now this car drives and looks as new as you will see on my pictures. I will send you 6 pictures, I hope you will include in your Ponton web page. At least with my car your Ponton page is complete. I wish you all the best with this magnificent web page and if I have some technical data to share I will write it to you, as I have done a lot of work myself."